Presenter Autumn Laughbaum has years of experience in implementing and optimizing genetic research workflows across various research organizations. In this webcast, she shares her expertise in investigating small-N NGS data and some tips and tricks for working with your data effectively. 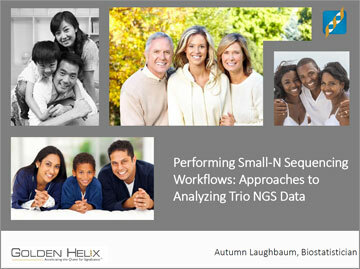 Researchers who are new to NGS data analysis will learn techniques commonly utilized in small-N sequencing workflows whereas experienced SVS users will discover more streamlined or "one-off" solutions to complement their advanced processes. The workflow for small-N trio data will cover three main aspects: data preparation, initial investigation, and variant analysis. To effectively showcase this workflow, Autumn will also highlight the online SVS Scripts Repository, which is home to several well-tested and high-quality tools that can become part of your analytic toolbox.